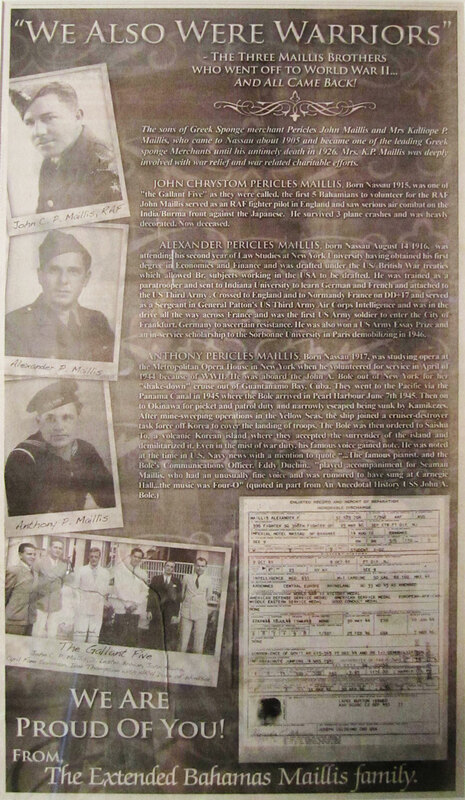 On the wall in the Maillis’ Law Office hangs a poster commemorating the World War II achievements of the senior generation of Maillis brothers. Under the title “We Also Were Warriors” is a photo and a brief write-up summarizing the involvement of each of the three brothers. In our studio we have on the wall one of the final portraits done for the Bahamian Project. It is of Peanuts Taylor, whose career as a musician back in his fledgling days, I was told, was aided by Alexander Maillis. After returning from the war Maillis and one of his brothers opened The Imperial – a restaurant and nightclub. It was during this time that he was critical in the development of some of our most well-known and beloved musicians, including Blind Blake, George Symonette and Peanuts Taylor. And also of interest, if you ever wondered where one of our most popular dishes “Cracked Conch” came from – well, Alexander Maillis invented that during his restaurant days – both the dish and the name. Since those days Mr. Maillis has been an attorney, an environmentalist, a politician – he was a founding member of the United Bahamian Party and later a member of the Progressive Liberal Party. He was instrumental in the leadership of International Air Bahama – an independent passenger flight transportation carrier founded in June 1968 – serving as managing director and then president of the airline in its heyday. He has been a man of the sea, a man of the church, a family man, a man who has served his country well. Now in his 90s the patriarch of the Maillis family enjoys retirement and reaps one of the greatest benefits of having sown a good life… the satisfaction of knowing that his contributions have made his country a better place. He lives by the sea on the south side of the island on a large family compound surrounded by mango orchards – the “Maillis Ponderosa” so to speak. Each year the Maillis family harvests many bushels of big juicy mangoes which are supplied to stores and vendors around the island. We wanted to document the senior Maillis in a way that related to his life today so we chose to photograph him with a mango and a rustic old knife in hand. He was a pleasure to photograph. Calliope, his wife for over sixty years, had accompanied him to the studio. After the photo session he looked at her with glee and told her he wanted a kiss. She obliged. 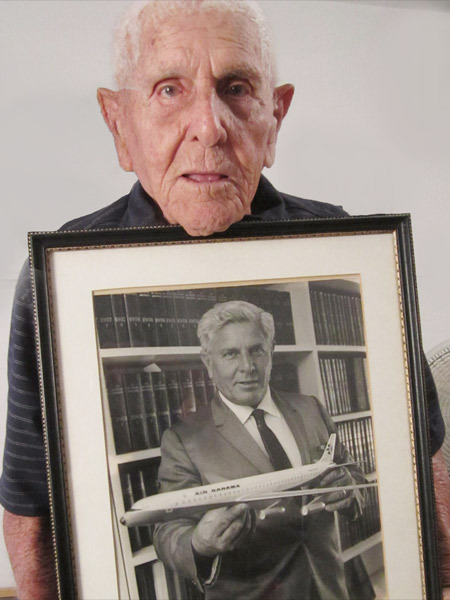 Documentary photo of Alexander Maillis by Lisa Wells. This is a beautiful write-up of an outstanding man. Knowing him personally, one would never be able to guess how many contributions he has made to the Bahamas and beyond to all the free world. Because of his humility, not one to live on his past laurels, his focus has been on what would be good, right, and necessary to do in the present day. Thank you for doing this project. I am so blessed to read about Mr. Maillis and look forward to reading about other Bahamians who have contributed to their beloved Bahamas-Land. We all need to take time to reflect on, be inspired by, and give thanks.